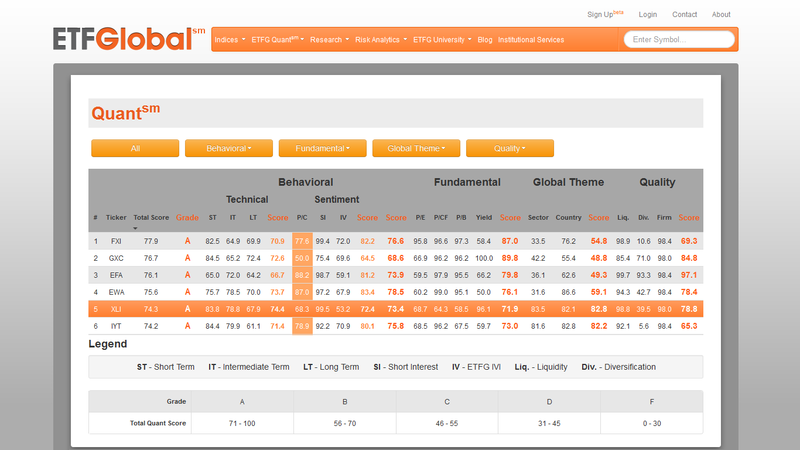 The goal of ETF Global’s Quant score is to provide investors a consistent structure to compare and research the growing ETF universe. ETFG uses both academic and proprietary research to gauge how likely an ETF will perform positively in the future. The ranking system is not designed to be and should not be used as a trading system. The rankings are not “buy” and “sell” recommendations. Each investor needs to take into consideration a number of factors including but not limited to their risk tolerance, time horizon and investment goals. 1) Momentum: Captures the speed of price changes. This is the “wind at your back” factor. It captures the tendency for rising prices to persist in the future. 2) Over/Under Bought: Measures how far “Stretched” a stock’s move is and is based on the “reversion to the mean” theory. 3) Strength: Determines if there is a higher likelihood of persistence in a price move. b) Sentiment – This uses market based data to quantify how investors view or feel about the market. Each factor is measured based on short and long term views, then weighted to get a single ranking value. 1) Put/Call Ratio: This is the ratio of Puts to Calls using opening transactions. As the number of puts increase relative to calls, investors are saying that they think the market will decrease in value. 2) Short Interest: When a stock is shorted, the investor borrows stock that they do not own and sells it in the market. The investor hopes to buy it back at a lower price to repay the loan. They are wagering that the stock will decrease in value. 3) Implied Volatility: This is a proprietary index that tries to gauge future volatility of the product. The process first tries to uses a model free formula to extract what investors think the future volatility of a security will be. This data is driven from current option prices. If we are not able to get satisfactory option data, we use a number of statistical processes to compute future volatility from other data points. The fundamental score consists of 4 ratio factors. We are able to aggregate these ratios for the underlying equity holdings of the ETF and roll those up to generate the ETF level data point. These weighted data points are then scored and ranked based on short and long term views. 1) Price to Earnings (P/E): The P/E is a ratio of current price to historical earnings. It is used to gauge how “Cheap” a security is. A cheaper stock should allow an investor to “buy” a dollar of earnings at a cheaper rate than a more expensive stock. Stocks with lower P/E ratios are typically labeled as “Value” stocks and higher P/E ratio stocks are labeled as “Growth” stocks. 2) Price to Cash Flow (P/CF): This is a measure that is very similar to the P/E but uses cash flow in the denominator instead of earnings. Depending on a company’s business model, cash flow may be a better gauge than earnings. Additionally, management is more limited in defining what effects cash flow compared to earnings. 3) Price to Book Value (P/B): This is another ratio that tries to gauge the value of a security. This ratio compares a security’s current price to the value of their assets on a per share basis. The lower this ratio, the cheaper it is to buy the assets (or portion) of the firm. 4) Dividend Yield: This is the ratio of dividends paid to current price of a security. It is how much you get paid to hold that security. This is more of a qualitative rank that ETFG assigns to a number of sectors and countries based on a general “Global Macro” view. This ranking group allows ETFG to over/under weight specific areas based of a few global themes that ETFG views as having significant long term impact on the markets. This ranking is to help show the efficiency and quality of the ETF in question and is based on 3 factors. 1) Liquidity: This is a combination of both Bid/Ask spread and volume of the ETF. It allows investors to gauge how their trading might impact the price of the specific ETF. The higher the rank, the easier it should be for an investor to trade the security and to lower any implicit costs. 2) Diversification: This measures how diversified an ETF is. The diversification impacts the volatility of the ETF and reduces potential unwanted hidden exposures. Although not always the case, the general view is that the greater the diversification the better the ETF is structured and the smoother the path of returns. 3) Sponsor Firm: This is a qualitative gauge of the quality of the sponsor of the ETF. Factors considered in this ranking include market position of the firm, size of the firm, ability to support losses, and firm history. A well-funded established firm will rank higher than a startup firm just getting into the industry.